Yesterday was my hubby’s birthday and I made him a cake slice box. I put photos of me and our fur babies inside the box wishing him a happy birthday. The challenge was in trying to decorate the box in a masculine way. I was inspired by The Paper Players Color Challenge – Cherry Cobbler, Not Quite Navy and Early Espresso. These colors are so rich together and masculine. I am also submitting my cake slice to Piece ‘O Cake Paper Craft Planet 3D challenge. 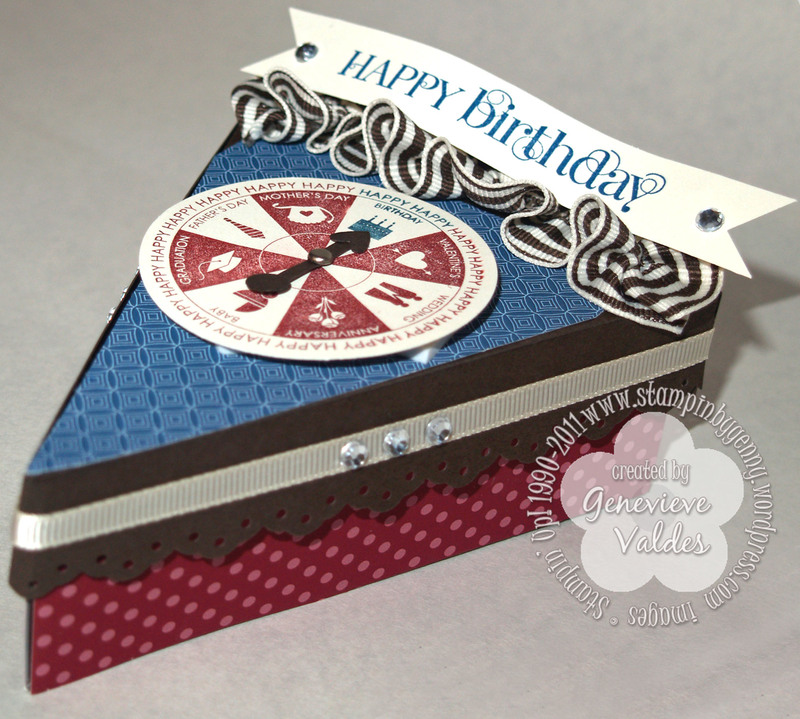 I made my cake box from Early Espresso card stock then covered with DSP printed from My Digital Studio – Cherry Cobbler polka dot and Not Quite Navy Villa DSP. I trimmed a 1-1/4″ strip of Early Espresso with the Eyelet Border punch and adhered to the lid. 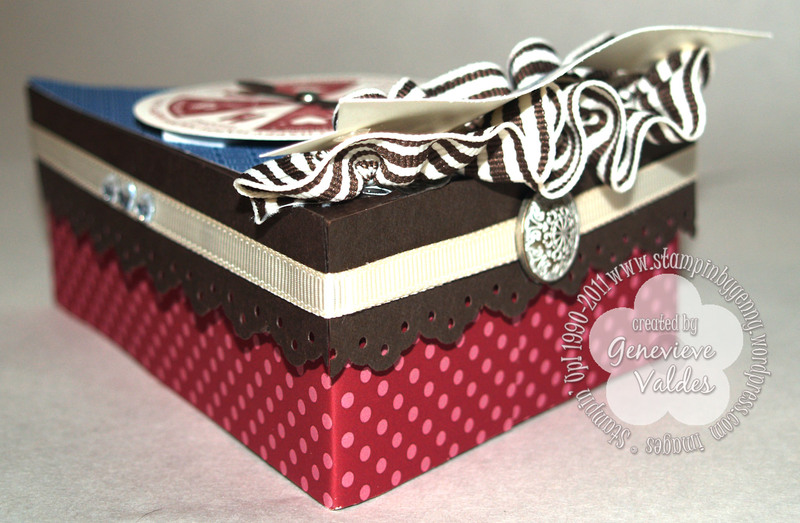 I also used the retired Take a Spin stamp set , Striped Early Espresso ribbon and Birthday Banner to decorate the top. I couldn’t resist and added clear rhinestones to the banner and the sides of the box. I also used an Antique brad for the back. I also used My Digital Studio to print the photos and then used the 2-3/8 inch circle punch. 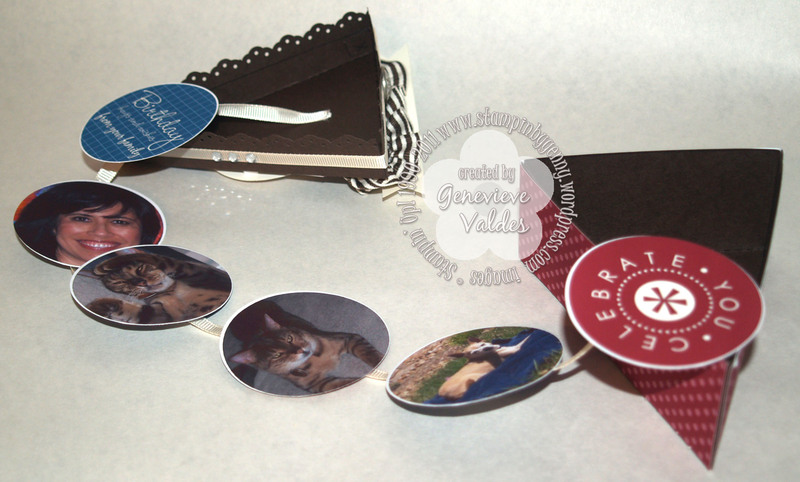 I attached the photos with mini glue dots to 1/4″ Very Vanilla grosgrain ribbon. I adhered each end with mini glue dots. 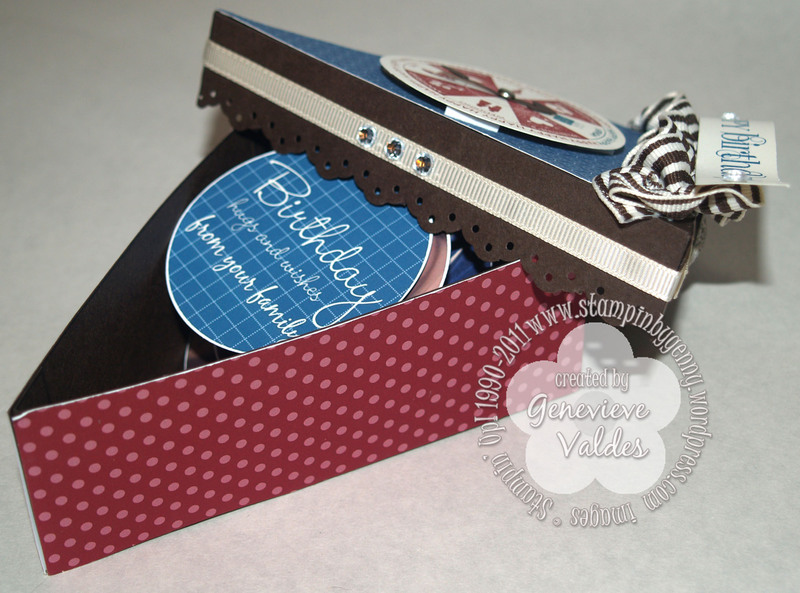 Template: There are many cake box templates out there but I wanted one with a lid and bottom so I created my own. I’m selling my two-piece cake box template for $2.99. Click here to purchase it. Oh, I love this! Great use of the colors and such a cool way to decorate the cake for your hubby! Thanks for sharing this wonderful idea! What a cute little cake slice box!! And, I love even more the pictures that come out of the box like a banner. So cute! The colors from The Paper Players are perfect for a masculine touch. I love it, Gen! And I’m sure German did, too. Almost as much as a real slice of cake! 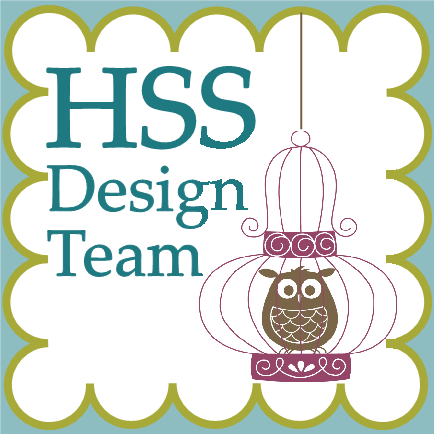 This is a fantastic project–very clever! Thanks for playing with the Paper Players this week! What a super cute cake box and the idea to create a picture garland of sorts inside once it’s opened. Fabulous. Love the way it’s decorated as well! Love the colors and what you put inside the cake! Thanks so much for sharing both of your yummy desserts at PCP 3D Tuesday. Fabulous job, Genny! Absolutely fabulous creation! Thanks for playing with The Paper Players!